NWS estimates 12-15 inches of snow in Conn. The fourth nor’easter this month is taking aim at storm-weary Connecticut with more than a foot of snow and gusty winds expected. And it’s all set to happen on the first full day of spring. The National Weather Service issued a winter storm warning for the area, with an expected snowfall of 12 to 15 inches for southern Connecticut. “Near blizzard conditions” are expected along coastal Connecticut during Wednesday’s snowstorm, the NWS reported. Winds are expected to hover in the 20 to 30 mph range, with the possibility of wind gusts up to 45 mph. Though those wind speeds don’t seem like much, partnered with the heavy snow, it could cause “widespred power ouages ... doned trees and power lines,” the NWS said. Visibility will likely be about a quarter of a mile at times. “Hazardous travel possible developing during the Wednesday morning commute and becoming neearly impossible for the afternoon and evening commute,” the weather service said. Snow is predicted to started between 7 a.m. and 9 a.m. Wednesday in southern Connecticut. It is expected that the snow will stop in southern Connecticut between 1 a.m. and 3 a.m. Thrusday. With all these estimations, the NWS admits there is some uncertainty. Among those the weather service is unclear of are: the location and timing of heaviest snowfall; definitive temperatures, especially during the day; and how much mixing with sleet, if any, will occur. First Selectman Peter J. Tesei announced that Greeniwch Town Hall will be open from 8 a.m. to 12 p.m. Wednesday. All town hall offices will close at noon. All meetings and events scheduled for the afternoon and evening have been cancelled. Mayor David Martin issued a snow emergency for Wednesday. School closure or early dismissal will be determined early Wednesday morning, according to Superintendent Earl Kim. Alternate side parking rules will automatically take effect each time there is snow accumulation greater than two inches. Trash pickup on Thursday will be moved to Friday. Friday pickup will be moved to Saturday. Mayor Harry Rilling declared a snow emergency for the city starting at 8 p.m. Tuesday. Garbage and recycling pick up will start one hour early on Wednesday. The city’s transfer station and yard waste site will be open at regularly scheduled hours Wednesday. The city’s fire department asks that residents “adopt a hydrant” — clear hydrants closest to their property during the storm in case firefighters need to access them during a blaze. Residents and businesses should clear sidewalk. Westport fire officials ask residents to use caution during Wednesday’s storm, have alternate travel plans and be prepared for changing weather conditions throughout the day. “Make safety your number one priority,” Westport fire department warned. To report a power outage, contact Eversource at 1-800-286-2000, or at www.eversource.com. The town’s public works road crews will attempt to stay ahead of the storm “by using tried and true plowing protocols,” the fire department said. Street will be plowed and sanded in order of priority — including main roads, steep hills and difficult intersection. Residents can find additional information on the town’s website www.westportct.gov. In anticipation of the pending snowstorm, the city has declared a snow emergency to take an effect midnight Wednesday. Bridgeport is expected to see between 9 and 12 inches of snow, expected to start to fall after 5 a.m. Wednesday. The city’s transfer station will be closed Wednesday and Thursday. Regularly scheduled trash and recycling for Wednesday will take place at midnight Wednesday. Pickup is scheduled to resume Friday with a one-day delay. Commercial and residential owners are responsible for clearing their sidewalks. Anyone caught pushing snow into the streets, or who fails to clear their sidewalk, is subject to a $100 fine for each ordinance. Any snow-related emergencies can be reported to the Bridgeport Emergency Operations Center at 203-579-3829. Any plowing concerns or issues can be addressed via Bridgeport 311 online or on the mobile application. The town’s emergency management team is coordinating with fire, police and Department of Public Works personnel in preparation of Wednesday’s storm. Officials in town are working with United Illuminating to ensure a coordinated response to any downed trees, wired and road closures that could be caused by the storm. All power outages should be reported to UI at 1-800-722-5584. The NWS announced a change to the winter storm warning issued for the area. The warning will now be in effect from 6 a.m. Wednesday to 6 a.m. Thursday. The warning said travel will be difficult to impossible, especially during the evening commute. Trumbull is preparing for the storm as they have for the last few, with their 26 snow plows repaired and ready to hit the 26 routes once the storm hits, according to Public Works director John Marsilio. Public works employees have been removing trees knocked down or damaged from the last storms. "We had a lot of tree damage in Trumbull and a lot of power outages. The procedure was to make the electric line safe and push the trees to the curb to provide an open road," Marsilio said. "Now we have to go out and remove those trees from the curb because the plows have to plow to the curb line and we don't want to hit those trees." The town ordered 500 tons more of salt in anticipation of the weather. Trumbull normally budgets about $325,000 a year for salt, but this season they've had to add to their usual amount twice and have spent nearly $500,000 on salt, according to Marsilio. Before precipitation changes to snow, a period of sleet is forecast between 1 and 5 a.m. Wednesday. Areas like Greenwich, Stamford, New Canaan and Norwalk could see the onset of steady precipitation between 2 and 4 a.m.
Areas north and east including Danbury, Milford, New Haven to New London will see steady sleet, freezing rain and snow between 4 and 7 a.m. According to the NWS hourly forecast, the best chance of snow is 9 a.m. to 9 p.m Wednesday. 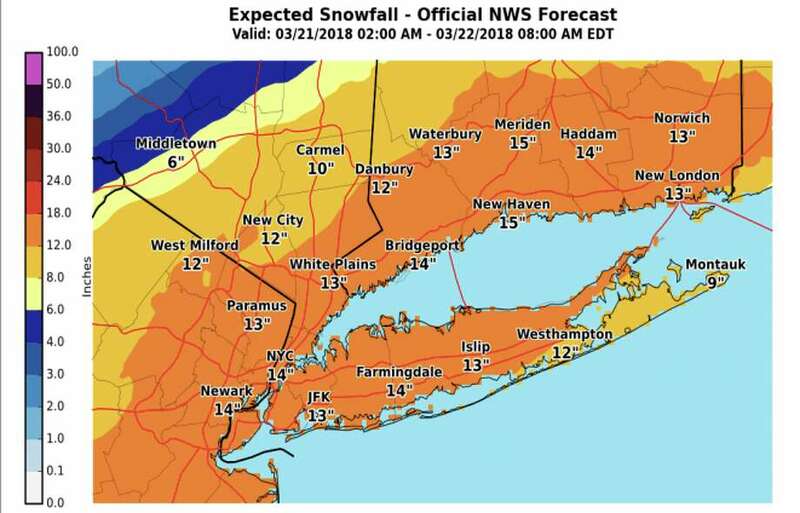 The heaviest snowfall will be between 2 and 8 p.m.
A map prepared Tuesday morning by the NWS New York office has expected snowfall at 16 inches in Danbury, between 13 and 15 along the southwest Connecticut shoreline, a foot in New Haven and 8 to 10 inches along the state’s southeastern coast. The NWS Boston office map has up to 18 inches in Fairfield and northern New Haven counties. It has between 6 to 8 inches in Litchfield County. In its forecast discussion, posted at 4:14 a.m. Tuesday, the NWS says: “Steadier precipitation is expected to develop after around midnight from south to north tonight, becoming more intense through the Wednesday morning commute. “Areas from about NYC eastward will also need to be monitored for a potential blizzard warning with strong winds around 20-30 mph with gusts up to 45 mph are expected. Of course, the NWS says the forecast could change. Over the weekend, forecasters said the storm would take a southern track and just brush the state. On Monday, snowfall estimates ranged between 6 to 8 inches. On Tuesday, snowfall totals are more than double that range. “There are still uncertanties with the exact track and strength of the storm,” the NWS said Tuesday morning. “A track farther to the north and west could result in more rain and sleet over coastal Connecticut and heavier snow totals elsewhere. Getting to work Wednesday morning doesn’t look to be too much of a problem because any accumulation will be less than an inch. But getting home is another story. With snowfall rates between 1 to 3 inches an hour expected by early afternoon, road crews will have a challenging time keeping roads clear. As he did during previous nor’easters, Gov. 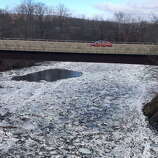 Dannel Malloy will likely ask people to stay off the roads to allow crews to clear highways. Tractor-trailer trucks may also be banned from roads for a period of time. Metro-North may need to temporarily suspend all service depending upon the severity of the weather. Amtrak is sure to cancel all trains Wednesday in the Northeast. Commuters are advised to check websites for the most up-to-date information. Given this is a late winter storm and temperatures will be somewhat warmer, wet snowfall is expected to be heavy, and combined with strong winds, may lead to downed trees and powerlines. In southwest Connecticut, the strongest wind gusts - between 35 and 45 mph - are expected from the shoreline to about 25 miles inland. Southern New Haven County and nearly all of Middlesex and New London counties are in the 35 and 45 mph gust category. Peak wind gusts between 25 and 35 are forecast in the greater Danbury area. During the March 2 nor’easter, more than 174,000 people lost power in the state. Five days later on March 7, another nor’easter knocked out power to 160,000 homes. Power was out for days in some homes in Greenwich and Stamford. It’s likely that school districts will be closed, businesses shut down and travel on roads discouraged. If the forecast holds, the nor’easter will put the Northeast at a standstill with dangerous travel on roads, cancelled flights and Metro-North and Amtrak trains. New York City has a forecast calling for 5 to 9 inches during the day ion Wednesday and another 5 to 9 during the night. Boston and southeast Massachusetts will get slammed with more than a foot of snow and wind gusts of more than 40 mph. Clouds will increase today, and temperatures are expected to remain well below normal, with highs reaching the upper 30s. Most of the day will be dry, but a light wintry mix of rain, snow and sleet is possible late in the day or this evening closer to the coast. The wintry precipitation will push north into the interior locations later tonight, but should remain light as temperatures fall through the 30s. On Wednesday, the entire area will have wintry precipitation, and it could be heavy at times. Temperatures struggle to rise into the lower to middle 30s and winds will be quite gusty from the northeast. Precipitation then tapers off Wednesday night with lows fallinginto the upper 20s to lower 30s. Tonight: A chance of rain and snow before 1 a.m., then a chance of rain, snow, and sleet between 1 a.m and 2 a.m, then snow, freezing rain, and sleet likely after 2 a.m. Cloudy, with a low around 30. Wind chill values between 20 and 30. Blustery, with a northeast wind 15 to 21 mph, with gusts as high as 31 mph. Chance of precipitation is 60 percent. Little or no ice accumulation expected. New snow and sleet accumulation of less than a half inch possible. Wednesday: Snow, freezing rain, and sleet, becoming all snow after 9 a.m. The snow could be heavy at times. Some thunder is also possible. High near 34. Wind chill values between 15 and 20. Windy, with a northeast wind around 26 mph, with gusts as high as 40 mph. Chance of precipitation is 100 percent. Little or no ice accumulation expected. New snow and sleet accumulation of 4 to 8 inches possible. Wednesday Night: Snow, mainly before 1 a.m. The snow could be heavy at times. Some thunder is also possible. Low around 31. Wind chill values between 20 and 25. Blustery, with a north wind 23 to 25 mph, with gusts as high as 36 mph. Chance of precipitation is 80 percent. New snow accumulation of 5 to 9 inches possible. Thursday: A 30 percent chance of snow, mainly before 7 a/m. Partly sunny, with a high near 42. North wind around 18 mph, with gusts as high as 28 mph.